Muddy cross-country run or a sociable long run? Decisions, decisions. This morning I had to choose between doing a cross-country race or a long run with other people who are training for Southampton Half Marathon. Although the weather forecast was good, I decided to avoid the cross-country race. My chest was still feeling the effects of yesterday’s run. Also the heavy rain meant that it would be a very muddy course. I was feeling quite tired, so I didn’t get up as early as I had planned. This meant that I didn’t have a lot of spare time before we were due to meet others. I ran up to The Common and met Teri on the way. Shortly afterwards, Stu caught up with us. It was quite a cold morning, but I had decided against wearing a headband. I was just wearing shorts and a t-shirt. Teri was concerned that she wouldn’t warm up. I knew that if I was moving at a reasonable pace there was more risk that I would overheat than be too cold. We met other people outside The Hawthorns and were divided into ability groups. I considered joining the 8:30-9:00 min/mile group, as my half marathon PB was run at a pace of 8:34 min/mile (5:19/km), but I decided to be sensible and stay with the 9:00 min/mile group. This proved to be the right decision as I was quite tired by the end of the run. After a quick warm-up, the coaches and run leaders were allocated to various groups. I was in a group of about 10 with Nic leading and Stu back-marking. 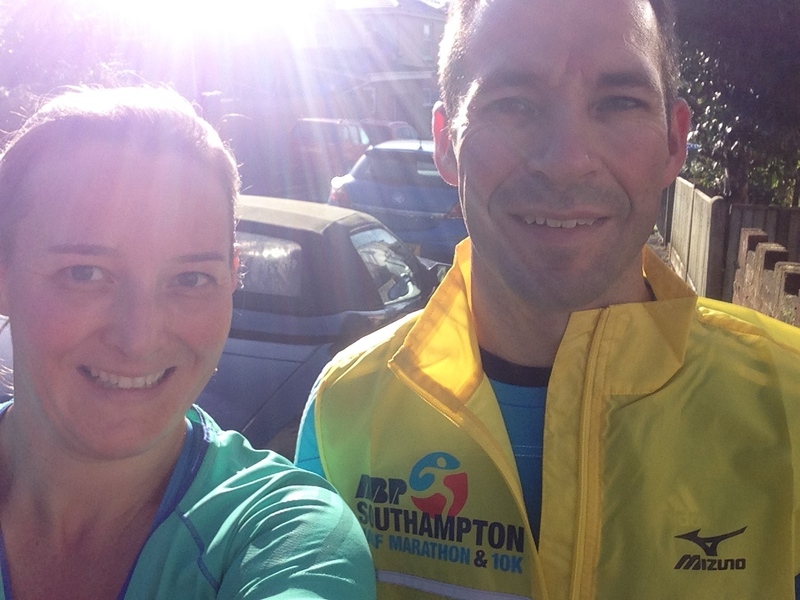 We went for a lovely run along some of the route of the half marathon, going through town and towards the Itchen Bridge before heading back to our starting point. The run up to The Common had been quite slow with my first km (uphill with no warm-up) taking me over 7 minutes, so I was quite pleased that until the final km of my 15km run, I managed to maintain a pace of under 6:00/km. My average pace for the run was 5:47/km. I’m hoping to maintain a pace of 5:40/km next weekend, so I think that may be possible, although it will depend on the wind. I think that Marafun have hit on a great idea of organising regular long training runs in the build-up to ABP Southampton Half Marathon and they’ve got some enthusiastic local runners to lead them. I’ll definitely be back for more! As I had worked quite hard, I felt really hungry when I got in. 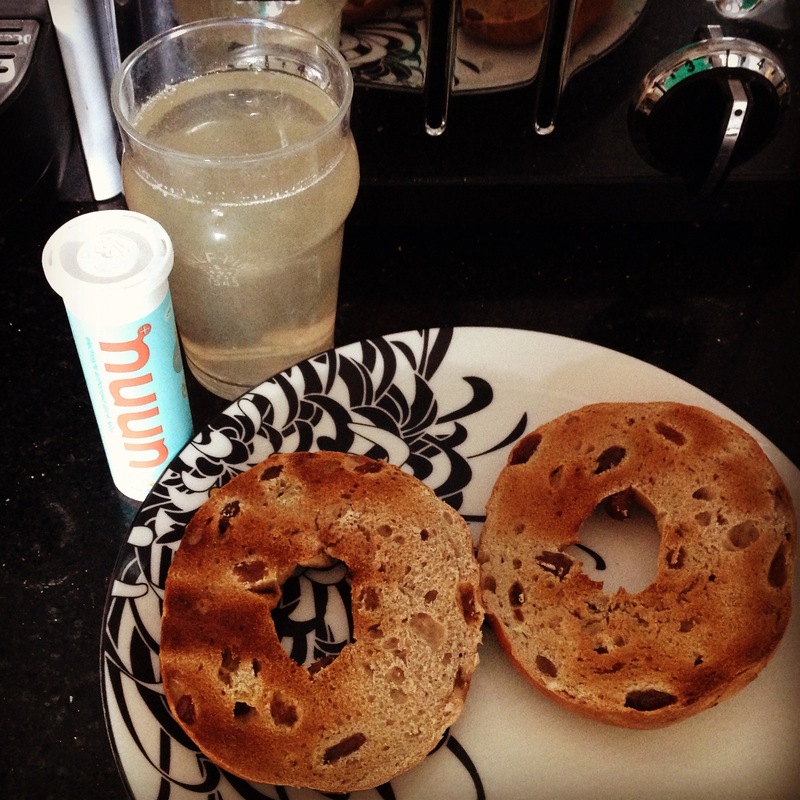 I treated myself to a cinnamon bagel and a glass of tropical nuun. The rest of today has been spent catching up with chores – there is never enough time during the week. I’ve just been watching Downton Abbey. Although I don’t need a large retinue of servants (my house is tiny), it would be lovely to have a housekeeper! I’m trying to get back to eating more healthily, so I made a frittata that I can eat for lunch this week at work. 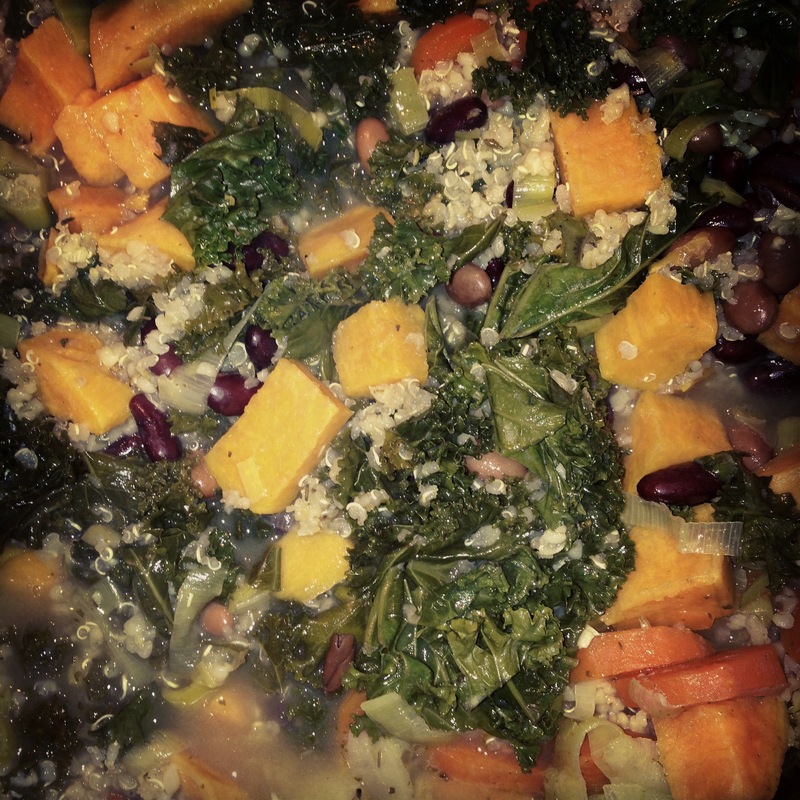 I also wanted to use up some kale that I had, so I adapted an Isa Chandra Moskowitz recipe to make a kale and sweet potato stew. I’ve made the ‘proper’ recipe several times before and really like it. It includes quinoa, but I didn’t have quite enough, so I supplemented it with some bulgar wheat. The parsnip and potatoes were subbed with sweet potato and the navy/white/haricot beans were replaced by pinto and kidney beans. Delicious and vegan! This week is going to be busy. I’ve got a new fitness class to try tomorrow as well as leading a running group and swimming. Then on Tuesday, I’ve got swimming. However, the workout that I’m looking forward to most is Thursday night’s track session. I feel that my speed work is starting to pay off and I’m desperate to do more. That stew looks AMAZING. I’ll see if I can *trick* Harry into eating it, hehe. THIS WEEK: Tuesday off! WOOT! It will be a great race… But only the slow half of Team Smith will be there – Stu was drawn in our running club’s London Marathon ballot! Maybe I’ll come down on the Saturday get absolutely off my face the night before then try and keep up with you during the race haha. That sweet potatoes & beans stew looks soooo tasty!